The purpose of this page (in a post-nuclear situation) will be to map out any targets in the state that were actually nuked. 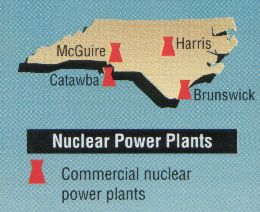 At the bottom of this page is the 1990 FEMA nuclear target map for North Carolina. It was just a conceptual map about the nuclear threat. Even an all-out nuclear war - did not by any means mean that every site would be hit. For some states VERY FEW and POSSIBLY / PROBABLY NONE of the sites will be hit but others may have some very significant targets. Because circumstances have changed since 1990 some of the targets in many of the maps should be removed and possibly there are others that should be added. Besides nuclear weapons there can be various radiological and other weapon hazards within your state and radiological threats may come from outside your state. 1. Nuclear power plants (think Chernoybl) for one. When the power, technology and personnel may not be available to maintain the plants - there is no telling what may happen to / with them. 2. The same applies to the storage of used nuclear fuel which presently has to be kept cooled and maintained. 3. Then there might somewhere be a stockpile of nuclear weapons. 4. Storage concerns should not be with just nuclear weapons but also with biological and chemical weapons. 5. There may just be hazardous stores of industrial chemicals that are no longer being maintained and protected. 6. There can be armories and warehouses of weapons and explosives that could fall into dangerous hands. 7. Whatever may be added to this list - needs to be identified and dealt with. 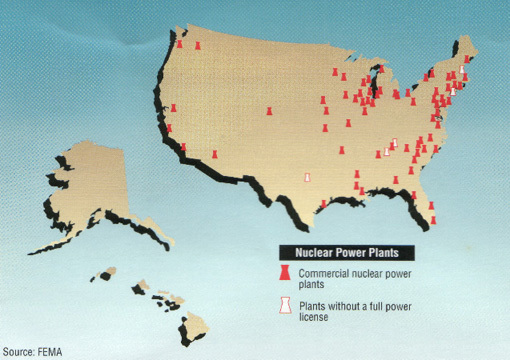 The following is a conceptual map of how a nuclear event one place in the US can affect other localities. This map is based upon past prevailing wind patterns but in the expected catastrophic events they may be much different from this. For the same reasons as fallout from power plants located elsewhere - fallout can come to your state from nuclear targets elsewhere. For this reason here is a map of all the targets that FEMA visualized in the US in 1990. In reality we should be showing nuclear targets throughout the world - because nuclear fallout can go anywhere in the world. And we haven't even mentioned EMP. Weapons exploded at high altitude for the sole purpose of creating EMP could turn off the lights in America. Permanently. Or in any case it could take a very long time to turn them back on - if you can imagine life without electricity.